On Thursday, February 10, 2016, from 6:30pm – 9:30pm, Oakland Zoo welcomes the public to attend a presentation by Shark Stewards, an organization dedicated to restoring ocean health by saving sharks and protecting critical ocean habitat. The second of Oakland Zoo’s 2016 Conservation Speaker Series, the evening will focus on the state and challenges of sharks – specifically, why many shark populations have declined by 80% and what we can do to take action to for sharks. “As apex predators, sharks are important to maintain the health and balance of marine ecosystems. Yet as many as 100 million sharks are being killed each year, and large shark populations are collapsing. This causes a negative cascade effect that impacts ocean health, and ultimately the health of all humanity who rely on the oceans for our air, our food, our climate and so much more. We are fighting to save sharks for the ocean, for biodiversity and for our future by creating positive solutions for Bay and Ocean Health,” said David McGuire, founder of the ‘Healthy Oceans and Bay’ campaign and Shark Stewards. The lecture will illustrate how overfishing, by-catching (catching sharks incidentally while fishing for other commercial species) and shark-finning are the primary reasons for the drastic decline in shark populations – and what can be done in light of these conservation challenges to reverse the trend. The Conservation Speaker Series will take place in Oakland Zoo’s Zimmer Auditorium, located at the lower entrance of the Zoo. Attendees can enjoy food and drinks from Cassave Food Truck and participate in a raffle that includes a trip to the Farallon Islands – courtesy of Shark Stewards. Parking is free and the admission price for the evening’s speaker presentations is $12.00 - $20.00 per person (sliding scale). All proceeds from this event will be donated to the Shark Stewards. Sharks are apex predators and have been around for 300 million years. Sharks are symbols of ocean health. 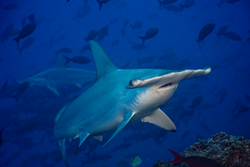 Sharks play a vital role in maintaining the health of coral reefs. Removing these predators through overfishing sets off a cascade of effects that ripple through the food chain. Nearly one out of four shark and ray species is classified by the IUCN (International Union for Conservation of Nature) as Threatened with extinction. A healthy and abundant ocean depends on predators like sharks keeping ecosystems balanced. And living sharks fuel local economies in some places where sharks bring millions of dollars through dive tourism. They may rule the ocean, but sharks are vulnerable. They grow slowly, produce few young, and, as such, are exceptionally susceptible to overexploitation. A marine biologist and ocean advocate, David McGuire is the founder of the Ocean Health and Shark Conservation non- profit Shark Stewards. As a Research Associate of the Department of Aquatic Biology at the California Academy of Sciences, David is conducting a shark research program that includes population studies, movements and fisheries impacts. As Captain, Dive Master and filmmaker, David has explored the world ocean on numerous sailing voyages producing media with an emphasis on ocean awareness. Educated in Marine Biology, he holds a Masters degree in Environmental Health and has worked in education and public health at the University of California at Berkeley for over a decade. David is the writer, producer and underwater cinematographer of several award winning documentaries focusing on sharks.